March 16, 2012 (Morongo, Casino) – Live form the Morongo Casino in Cabazon, Calif., and televised live on ESPN “Friday Night Fights”, former World Boxing Organization (WBO) junior welterweight champion Kendall Holt (28-5, 16 KOs) and Tim Coleman (19-2-1, 5 KOs) went toe to toe in a scheduled 10-round main event bout that ended early. Gary Shaw Productions and Thompson Boxing were the promoters. In the first round, Holt dominated, landing a devastating body blow that sent Coleman to the canvas. Showing heart, Coleman bounced up and finished the round. The onslaught continued in the second round as Holt battered the overmatched Coleman, putting him down two more times before Coleman’s corner seen enough and threw in the towel, ending the bout at the 2:23 mark of round two. In the eight-round co-main event, La Puente’s Abraham Lopez (17-0, 12 KOs) remained unbeaten by defeating Glendales’s Gabriel Tolmajyan (12-2-1, 3 KOs) via unanimous decision. Both fighters started off slowly, trying to find their range. Lopez was backing up in the early rounds but started to come forward in the middle to late rounds. Both fighters had their moments, but Lopez was the busier fighter and triumphed by the scores of 79-73 and 78-74 twice. Crowd favorite Luna remained undefeated with a fourth-round knockout.The aggressor throughout, Lubar landed hard punches to the head and body as Mendoza started to wear down. Luna kept coming forward. A right hand to the temple of Mendoza started the downward spiral for the tough Mexican. An overhand right by Luna dropped Mendoza in round four and he was down for the entire eight count. After getting up, Mendoza was still on wobbly legs and the referee stoped the bout at the 2:45 mark of the fourth. (Six-round super-bantamweight bout) – Roman Morales (10-0, 6 KOs) vs. Rufino Serrano (12-4) – Keeping his record unblemished, the unbeaten Morales cruised to a unanimous six-round decision. Both boxers had their moments, but Morales was the stronger fighter, landing the harder blows throughout. Morales put Serrano on the canvas with a beautiful body blow in round five and continued to apply pressure throughout round six to win by 60-53 and 59-54 twice. Featherweights Tapia and Garcia slugged it during an entertaining match that ended in a four-round split draw. Both fighters came out aggressively, landing hard shots. Garcia was coming forward most of the fight and put Tapia down in round three with an overhand right. Tapia kept his composure and ended the out strongly. At the finish, one judge had it for Tapia (38-37), one scored it for Garcia (38-37) and the other called it 38-38. 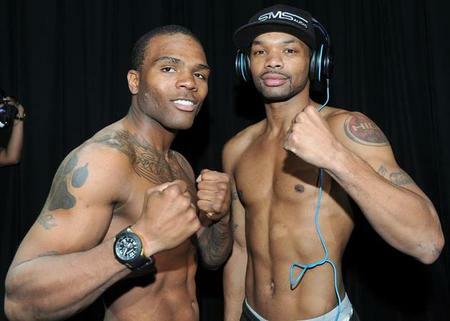 (Four-round featherweight bout) – Derrick Murray (2-0, 1 KO) vs. Cesar Valenzuela (2-1-1) . In a battle of undefeated prospects, Murray was too much for a game Valenzuela, winning a hard- fought unanimous decision. Murray, the shorter fighter, found a home for his body attack, dropping Valenzuela in the final round, and went on to win by 40-35 and 39-36. (Four-round lightweight bout) – Jesus Gutierrez (3-0, 1 KO) vs.Manuel Del Cid (4-9, 1 KOs) – Gutierrez extended on his unbeaten streak by winning a unanimous decision for the for the second time in his career. The referee deducted two points from Del Cid, one in the second and another in the third, both for holding. The short-armed Gutierrez could not land anything significant as the taller Del Cid stayed out of range. Gutierrez wins by 40-34 across the board.